[S28] James Alonzo Matthews, Jr. and Lucille Pearce, comps., Pearce, Bartlett, Matthews, Smart, and Allied Families (Austin, Tex. : Eakin Publications, Inc., 1983), p. 182. [S517] Gary Boyd Roberts, 1401 E. 55th St., Apt. 508, Chicago, Ill. 60615, letter to Joseph A. Guthrie, 16 May 1973, (naming George Pool as her father). A copy of the letter is in the possession of Roger Bartlett. [S517] Gary Boyd Roberts, 16 May 1973 letter, above, (naming Martha Pool ["almost certainly Martha Mitchell before her marriage"] as her mother). [S517] Gary Boyd Roberts, 16 May 1973 letter, above. [S517] Gary Boyd Roberts, 16 May 1973 letter, above, (naming Caroline Pool as his mother). [S517] Gary Boyd Roberts, 1401 E. 55th St., Apt. 508, Chicago, Ill. 60615, letter to Joseph A. Guthrie, 16 May 1973. A copy of the letter is in the possession of Roger Bartlett. [S517] Gary Boyd Roberts, 16 May 1973 letter, above, (naming Ephriam H. Root as his father). [S517] Gary Boyd Roberts, 1401 E. 55th St., Apt. 508, Chicago, Ill. 60615, letter to Joseph A. Guthrie, 16 May 1973, (naming Ephriam H. Root as his father). A copy of the letter is in the possession of Roger Bartlett. [S28] James Alonzo Matthews, Jr. et al., Pearce [etc.] and Allied Families, above, p. 182 (naming Dora Elizabeth Owens as her mother). Other Names*: Agnes DeLashmutt, Agnes Gertrude DeLashmutt Phillips, Agnes DeLashmutt Phillips, Agnes Gertrude Phillips, Agnes Phillips. [S28] James Alonzo Matthews, Jr. and Lucille Pearce, comps., Pearce, Bartlett, Matthews, Smart, and Allied Families (Austin, Tex. : Eakin Publications, Inc., 1983), p. 182 (naming John Lindsey DeLashmutt as her father). [S28] James Alonzo Matthews, Jr. et al., Pearce [etc.] and Allied Families, above, p. 182. [S961] Find A Grave, online at http://www.findagrave.com, memorial for Agnes G. Phillips, memorial no. 33593397, viewed on 24 Mar 2018 (giving the year but no other information). [S961] Find A Grave, online, above, memorial for Agnes G. Phillips, memorial no. 33593397, viewed on 24 Mar 2018. [S28] James Alonzo Matthews, Jr. et al., Pearce [etc.] and Allied Families, above, p. 183 (naming Agnes Gertrude DeLashmutt as his mother). [S28] James Alonzo Matthews, Jr. et al., Pearce [etc.] and Allied Families, above, pp. 182, 183. [S28] James Alonzo Matthews, Jr. et al., Pearce [etc.] and Allied Families, above, p. 183. [S28] James Alonzo Matthews, Jr. et al., Pearce [etc.] and Allied Families, above, p. 183 (naming Esther May DeLashmutt as her mother). [S312] Social Security Death Index, online at http://tinyurl.com/AncestrySSDI, viewed on 15 Jun 2003. [S312] Social Security Death Index, online at http://tinyurl.com/AncestrySSDI, viewed on 15 Jun 2003 (not naming the place of death but stating that she lived in Omaha, Neb. when she died). [S312] Social Security Death Index, online at http://tinyurl.com/AncestrySSDI, viewed on 15 Jum 2003. [S312] Social Security Death Index, online at http://tinyurl.com/AncestrySSDI, viewed on 15 Jun 2003 (not naming the place of death but stating that she lived in Granada Hills, Calif. when she died). • Her obituary from a local newspaper is here. [S28] James Alonzo Matthews, Jr. et al., Pearce [etc.] and Allied Families, above, p. 183 (giving his name as Don P. Hill). [S28] James Alonzo Matthews, Jr. et al., Pearce [etc.] and Allied Families, above, pp. 182 (giving only the date), 183. [S961] Find A Grave, online at http://www.findagrave.com, memorial for J. Frank Phillips, memorial no. 33593340, viewed on 24 Mar 2018. [S28] James Alonzo Matthews, Jr. et al., Pearce [etc.] and Allied Families, above, p. 183 (naming J. Frank Phillips as his father). Other Names*: John L. Phillips, Johnnie L. Phillips. [S28] James Alonzo Matthews, Jr. and Lucille Pearce, comps., Pearce, Bartlett, Matthews, Smart, and Allied Families (Austin, Tex. : Eakin Publications, Inc., 1983), p. 183 (naming J. Frank Phillips as his father). [S961] Find A Grave, online at http://www.findagrave.com, memorial for Johnie L. Phillips, memorial no. 33593345, viewed on 24 Mar 2018 (giving the year but no other information). [S961] Find A Grave, online, above, memorial for Johnie L. Phillips, memorial no. 33593345, viewed on 24 Mar 2018. [S28] James Alonzo Matthews, Jr. et al., Pearce [etc.] and Allied Families, above, p. 183 (naming John Leslie Phillips as her father). [S28] James Alonzo Matthews, Jr. and Lucille Pearce, comps., Pearce, Bartlett, Matthews, Smart, and Allied Families (Austin, Tex. : Eakin Publications, Inc., 1983), p. 183 (naming John Leslie Phillips as her father). [S28] James Alonzo Matthews, Jr. and Lucille Pearce, comps., Pearce, Bartlett, Matthews, Smart, and Allied Families (Austin, Tex. : Eakin Publications, Inc., 1983), p. 183 (naming Isaac Newton Bramhall as his father). [S28] James Alonzo Matthews, Jr. et al., Pearce [etc.] and Allied Families, above, p. 183 (naming Hattie Josephine Palmantier as his mother). [S28] James Alonzo Matthews, Jr. et al., Pearce [etc.] and Allied Families, above, p. 183 (naming Donald F. Bramhall as her father). Marriage*: He married Hattie Josephine Palmantier. [S28] James Alonzo Matthews, Jr. and Lucille Pearce, comps., Pearce, Bartlett, Matthews, Smart, and Allied Families (Austin, Tex. : Eakin Publications, Inc., 1983), p. 183 (naming Joseph Payton Bramhall as his father). [S28] James Alonzo Matthews, Jr. et al., Pearce [etc.] and Allied Families, above, p. 183 (naming Nancy Vaughan as his mother). [S28] James Alonzo Matthews, Jr. et al., Pearce [etc.] and Allied Families, above, p. 183 (naming Isaac Newton Bramhall as his father). Marriage*: She married Isaac Newton Bramhall, son of Joseph Payton Bramhall and Nancy Vaughan. [S28] James Alonzo Matthews, Jr. and Lucille Pearce, comps., Pearce, Bartlett, Matthews, Smart, and Allied Families (Austin, Tex. : Eakin Publications, Inc., 1983), p. 183 (naming Hattie Josephine Palmantier as his mother). Marriage*: He married Nancy Vaughan. [S28] James Alonzo Matthews, Jr. and Lucille Pearce, comps., Pearce, Bartlett, Matthews, Smart, and Allied Families (Austin, Tex. : Eakin Publications, Inc., 1983), p. 183. [S28] James Alonzo Matthews, Jr. et al., Pearce [etc.] and Allied Families, above, p. 183 (naming Joseph Payton Bramhall as his father). Marriage*: She married Joseph Payton Bramhall. [S28] James Alonzo Matthews, Jr. and Lucille Pearce, comps., Pearce, Bartlett, Matthews, Smart, and Allied Families (Austin, Tex. : Eakin Publications, Inc., 1983), p. 183 (naming Donald F. Bramhall as her father). [S994] Sheryl Hill, electronic mail to Roger Bartlett, 6 Sep 2004, citing Los Angeles County, California certificate of death for Dow P. Hill, John M. Isaac, Executor, informant (naming Allen T. Hill as his father). [S994] Sheryl Hill, electronic mail to Roger Bartlett, 6 Sep 2004, citing Los Angeles County, California certificate of death for Dow P. Hill, John M. Isaac, Executor, informant (naming Mary E. Price as his mother). [S994] Sheryl Hill, electronic mail to Roger Bartlett, 6 Sep 2004, citing Los Angeles County, California certificate of death for Dow P. Hill, John M. Isaac, Executor, informant. [S312] Social Security Death Index, online at http://tinyurl.com/AncestrySSDI, viewed on 7 Sep 2004 (giving the date but not the place). [S28] James Alonzo Matthews, Jr. and Lucille Pearce, comps., Pearce, Bartlett, Matthews, Smart, and Allied Families (Austin, Tex. : Eakin Publications, Inc., 1983), p. 183 (giving his name as Don P. Hill). [S312] Social Security Death Index, online at http://tinyurl.com/AncestrySSDI, viewed on 7 Sep 2004 (not naming the place of death but stating that he lived in La Mirada, Calif. when he died). [S28] James Alonzo Matthews, Jr. et al., Pearce [etc.] and Allied Families, above, p. 183 (giving his name as Don P. Hill, giving 1892 as his birth date, and stating he served in World War I). [S994] Sheryl Hill, electronic mail to Roger Bartlett, 6 Sep 2004, citing Los Angeles County, California certificate of death for Dow P. Hill, John M. Isaac, Executor, informant (giving his occupation and cause of death and stating that his usual residence was in Los Angeles, California). [S312] Social Security Death Index, online at http://tinyurl.com/AncestrySSDI, viewed on 7 Sep 2004 (stating that he lived in La Mirada, Calif. when he died). Margaret Jane Taliaferro's tombstone, Harrison Cemetery, Whiting, Iowa, from findagrave.com, courtesy of Linda Walker. [S961] Find A Grave, online at http://www.findagrave.com, memorial for Margaret Jane Taliaferro DeLashmutt, memorial no. 40273234, viewed on 1 Jul 2011. [S961] Find A Grave, online, above, memorial for Margaret Jane Taliaferro DeLashmutt, memorial no. 40273234, viewed on 1 Jul 2011 (not giving the date). [S961] Find A Grave, online, above, memorial for Elias Nelson DeLashmutt, memorial no. 40273198, viewed on 1 Jul 2011 (not giving the date). [S28] James Alonzo Matthews, Jr. et al., Pearce [etc.] and Allied Families, above, p. 184 (naming Margaret Taliferro as her mother). [S28] James Alonzo Matthews, Jr. et al., Pearce [etc.] and Allied Families, above, p. 183 (naming Margaret Taliferro as her mother). [S961] Find A Grave, online, above, memorial for William Clay DeLashmutt, memorial no. 40273312, viewed on 1 Jul 2011 (naming Margaret Jane Taliaferro DeLashmutt as his mother). [S961] Find A Grave, online, above, memorial for John Wesley DeLashmutt, memorial no. 40519721, viewed on 1 Jul 2011 (naming Margaret Jane Taliaferro DeLashmutt as his mother). [S961] Find A Grave, online, above, memorial for Marsh J. DeLashmutt, memorial no. 40273389, viewed on 5 Jul 2011 (naming Margaret Jane Taliaferro DeLashmutt as his mother). [S961] Find A Grave, online, above, memorial for Ernest Nelson DeLashmutt, memorial no. 40519185, viewed on 30 Jun 2011 (naming Margaret Jane Taliaferro DeLashmutt as his mother). [S961] Find A Grave, online, above, memorial for Dell Edward DeLashmutt, memorial no. 40273427, viewed on 30 Jun 2011 (naming Margaret Jane Taliaferro DeLashmutt as his mother). [S961] Find A Grave, online, above, memorial for Theodore Clarence DeLashmutt, memorial no. 40273495, viewed on 5 Jul 2011 (naming Margaret Jane Taliaferro DeLashmutt as his mother). [S961] Find A Grave, online, above, memorial for Gertrude Louise DeLashmutt Dahl, memorial no. 40313378, viewed on 5 Jul 2011 (naming Margaret Jane Taliaferro DeLashmutt as her mother). [S961] Find A Grave, online, above, memorial for Dudley Wilson DeLashmutt, memorial no. 40313867, viewed on 30 Jun 2011 (naming Margaret Jane Taliaferro DeLashmutt as his mother). Birth*: He was born circa 1876. [S28] James Alonzo Matthews, Jr. and Lucille Pearce, comps., Pearce, Bartlett, Matthews, Smart, and Allied Families (Austin, Tex. : Eakin Publications, Inc., 1983), p. 183 (naming Elias Nelson DeLashmutt as his father). [S961] Find A Grave, online at http://www.findagrave.com, memorial for Jesse DeLashmutt, memorial no. 60653135, viewed on 4 Jul 2011. [S961] Find A Grave, online, above, memorial for Jesse DeLashmutt, memorial no. 60653135, viewed on 4 Jul 2011 (stating that his grave is not marked). [S28] James Alonzo Matthews, Jr. et al., Pearce [etc.] and Allied Families, above, pp. 183-84. William Clay De Lashmutt's tombstone, Harrison Cemetery, Whiting, Iowa, from findagrave.com, courtesy of Linda Walker. [S28] James Alonzo Matthews, Jr. and Lucille Pearce, comps., Pearce, Bartlett, Matthews, Smart, and Allied Families (Austin, Tex. : Eakin Publications, Inc., 1983), p. 184 (naming Elias Nelson DeLashmutt as his father). 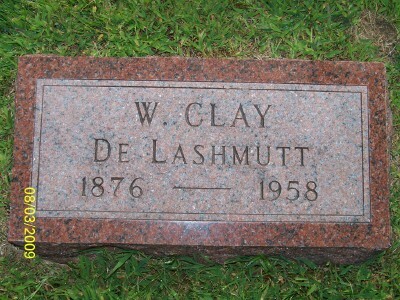 [S961] Find A Grave, online at http://www.findagrave.com, memorial for William Clay DeLashmutt, memorial no. 40273312, viewed on 1 Jul 2011 (naming Elias Nelson DeLashmutt as his father). [S961] Find A Grave, online, above, memorial for William Clay DeLashmutt, memorial no. 40273312, viewed on 1 Jul 2011. [S28] James Alonzo Matthews, Jr. et al., Pearce [etc.] and Allied Families, above, p. 184. [S961] Find A Grave, online, above, memorial for Kitty Fay Polly DeLashmutt, memorial no. 28217989, viewed on 1 Jul 2011. Marriage*: He married Alice McKinley ('Ellie') Anderson. [S961] Find A Grave, online at http://www.findagrave.com, memorial for John Wesley DeLashmutt, memorial no. 40519721, viewed on 1 Jul 2011 (naming Elias Nelson DeLashmutt as his father). [S961] Find A Grave, online, above, memorial for John Wesley DeLashmutt, memorial no. 40519721, viewed on 1 Jul 2011. 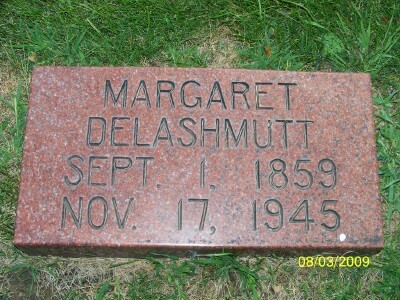 [S961] Find A Grave, online at http://www.findagrave.com, memorial for Marsh J. DeLashmutt, memorial no. 40273389, viewed on 5 Jul 2011 (naming Elias Nelson DeLashmutt as his father). [S961] Find A Grave, online, above, memorial for Marsh J. DeLashmutt, memorial no. 40273389, viewed on 5 Jul 2011. [S961] Find A Grave, online at http://www.findagrave.com, memorial for Ernest Nelson DeLashmutt, memorial no. 40519185, viewed on 30 Jun 2011 (naming Elias Nelson DeLashmutt as his father). [S961] Find A Grave, online, above, memorial for Ernest Nelson DeLashmutt, memorial no. 40519185, viewed on 30 Jun 2011. [S961] Find A Grave, online, above, memorial for Ruth Ellen Beigel DeLashmutt, memorial no. 40519215, viewed on 30 Jun 2011. [S961] Find A Grave, online, above, memorial for Charles Ernest DeLashmutt, memorial no. 40519614, viewed on 30 Jun 2011 (naming Ernest Nelson DeLashmutt as his father).